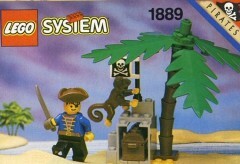 Today's random set is 1889 Pirates Treasure Hold, released in 1992. It's one of 9 Pirates sets produced that year. It contains 34 pieces and 1 minifig. It's owned by 821 Brickset members. If you want to add it to your collection you might find it for sale at BrickLink or eBay. I love those older monkeys! And to get it in little sets is a great deal! Another little limited release set. It's not much of a hiding spot for the treasure chest though, is it, I mean, it's not even covered from inclement weather or parrot droppings. Delightful little set. But why isn’t the monkey considered a minifig?! Because if it was, Captain Redbeard would only be the second coolest minifigure. I bought a dozen of these as a kid. Before 12 Monkeys became a movie favourite and before I had large barrels from the Western kits. Usually had them be jerks when I played. Awesome pricing for a monkey set. I want these palm trees back!! Why does the monkey have yellow hands?? I miss the Pirates theme. I think LEGO needs to release a new Pirates line!!! I think I had two or three of these. I seem to recall picking them up on sale at Zeller's with my allowance. I want old wall panels back. They allowed for efficient space use such as fitting the treasure chest in this set. In old sets space was maximized, like in 4-stud-wide vehicles. I guess LEGO no longer values space efficiency as they moved on to 6-stud and 8-stud vehicles as the new standard for minifigure scale. In, like, 2011, LEGO changed all the panels to have stupid, ugly reinforcements. Now they are no longer flush when lined up and are thicker. I don't know why reinforcements were needed as I have treated the old-style panels roughly and they never broke or bent. I think this was the worst LEGO mold change of all time. I've said it before, any set with a monkey is a good set...as well as a palm tree, treasure chest, actually this is just a great set for the money! Love the old Pirate sets, they really were well designed sets in terms of doing more with less. I love the design of the palm trees.